Featuring 15 high quality tracks from each band that performed at this years RockWich 2015 festival, the limited edition commemorative RockWich 2015 CD is now available. Compiled by Toby Winch – in assosiation with Prometheus Promotions – to commemorate this amazing event, Rockwich 2015 features NWOBHM heroes Salem and Avenger, Hard Rockers Bigfoot, Bad Touch and Theia and many more. 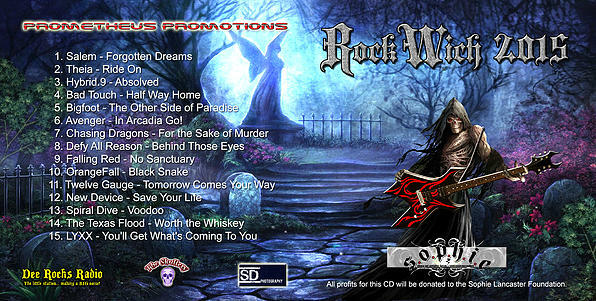 All profits collected from the sale of this CD will go to the Sophie Lancaster Foundation. A great cause and some truly great bands….lap it up!